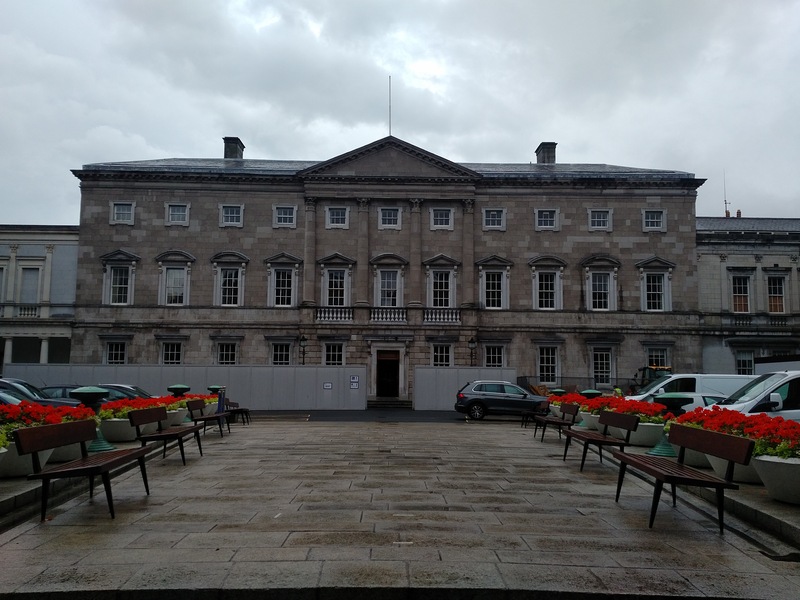 During a wonderful trip to Ireland, I took this photo of the Oireachtas on 21 August 2017, while it was undergoing renovation. If only I had discovered these little gems in time! The Commonwealth Law Bulletin will publish later this year my article “‘Indirect Amendment’: How the Federal Department of Justice Unilaterally Alters the Text of the Constitution of Canada.” In the early 20th century, the Department of Justice had published consolidated versions of the British North America Acts for years, which usually compiled the complete text of every British North America Act from 1867 to the time of publication. But a senior lawyer and civil servant within the Department of Justice, Elmer Driedger, first devised an alternative which attempts to incorporate all changes into one document, a method and rationale which he called “Indirect Amendment.” The Department of Justice still employs this method today, most recently in a consolidation of the Constitution Acts, 1867-1982 published in 2013. Only in this most recent edition has the Department of Justice adopted the term “Non-Textual Amendment” instead of the original “Indirect Amendment.” Driedger died in 1985, but his legacy lives on in the foreword to these consolidations. But some erroneous applications of the Driedger Method have popped up since his death, and I wish that I had noticed this one earlier when I could still have added it to my article. Section 40 of the British North America Act, 1867 originally defined the majoritarian electoral system by which eligible voters elected MPs to the House of Commons, and the First Schedule complemented it by further listing and defining all of the electoral districts of the four provinces. But even though the First Schedule to the British North America Act, 1867 lists the initial boundaries of federal electoral districts for the House of Commons of the Dominion of Canada, the Department of Justice indicates at footnote or endnote 78 in both the consolidations from 2001 and 2013 that a provincial statute from Ontario – Representation Act, R.S.O. 1990, c. R.26 – has rendered them spent. This is false on multiple levels. Some official or officials in the Department of Justice made a bizarre mistake. First and most fundamentally, the Legislature of Ontario is not competent to legislate for the Dominion of Canada; only the Parliament of Canada can provide for the boundaries of federal electoral districts. Ontario’s Representation Act, 1990 would certainly serve as the equivalent of the Representation Order promulgated under the Electoral Boundaries Readjustment Act, but it most certainly has not amended anything federal. Second, the Legislature of Ontario repealed the Representation Act, 1990 in 1999 and passed new legislation for provincial electoral districts a few more times since, so this inaccurately cited provincial statute isn’t even up to date in its incorrectness. Finally, this example shows the perils of the Driedger Method of Indirect Amendment or Non-Textual Amendment: scholars and lawyers and judges who routinely cite the Constitution Acts treat the Department of Justice’s consolidations as official, yet they have accumulated layers of inconsistencies over the years through an inaccurate application of the Indirect Amendment Method. This Method could work in theory if DoJ applied enough vigilance to it. But even then, it presents fundamental flaws in principle, chiefly arbitrariness. I highlighted other such examples of the inconsistent application of the Indirect Amendment Method in my upcoming article, such as the fact that the Department of Justice alters the text of section 37 of the Constitution Act, 1867 to what it should say based on the Representation Orders promulgated under the Electoral Boundaries Readjustment Act, but that it has not updated the name of the Province of Newfoundland and Labrador in section 22 or section 37 – even though a real and proper constitutional amendment to this effect (promulgated under the Section 43 Procedure) entered into force in 2001. This constitutional amendment only officially changed “Newfoundland” to “Newfoundland and Labrador” within the Newfoundland Act, which form the Terms of Union by which Newfoundland joined Confederation in 1949. But why not change the other things under the Indirect Amendment Method? After all, parliament has also never amended section 37, and the Department of Justice changes the text of this provision anyway. The most recent edition of the consolidation of the Constitution Acts from 2013 doesn’t even mention this constitutional amendment anywhere, not even in a footnote or endnote! This is inexcusable. In 1982, the Department of Justice renamed the British North America Act, 1949 (Newfoundland) the Newfoundland Act. So why not further rename it the Newfoundland and Labrador Act now that the name of the province has officially changed from Newfoundland to Newfoundland and Labrador? Again, the fact that the constitutional amendment doesn’t actually prescribe amending the name of the act itself shouldn’t become an insurmountable barrier to the Department of Justice based on how it has altered the text of other provisions of the Constitution Act, 1867 in the absence of constitutional amendments to those provisions, like with section 37. And what could be more fundamental than the number of provinces which comprise Canada? The Department of Justice has “indirectly amended” section 37 but left section 5, which says that Canada consists of only 4 provinces, intact, relegating to a endnote all the Imperial Orders-in-Council and Canadian statutes which expanded this country into a three-ocean Dominion. Why? Why does the Department of Justice take these various different approaches for different provisions of the Constitution Acts? Some, like section 37, are changed to what they should say based on new legislation even though they’ve never been amended under Part V of the Constitution Act, 1982. Others, like section 5, serve as time capsules from 1867, retain their historical integrity, and remain intact, while good explanatory footnotes or endnotes explain why they have become out of date. Others, like section 22, were legitimately “indirectly amended” by a statute or executive instrument listed in the Schedule to the Constitution Act, 1982 but were not consistently updated by the Department of Justice. Presumably, DoJ once updated them as an alternative to including the new legislation or executive instrument as part of a complete and unabridged consolidation of the British North America Acts as annexes to the original British North America Act, 1867. Frankly, there is no rhyme or reason or method to this madness. The Indirect Amendment Method is inherently arbitrary, and that is one of the reasons why the Department of Justice should stop using it. Instead, we should revert back to what we used before Elmer Driedger introduced his method in the mid-1960s. The Department of Justice and Parliament of Canada used to produce full, unabridged compendiums of the British North America Acts, from 1867 to the time of their publication, sequentially. That way, you could see all these statutes in the forms in which the Imperial Parliament and Parliament of Canada enacted them. Historians and lawyers – who thrive on detail (or pedantry, depending on your viewpoint) – would find such longer consolidations eminently useful, not too cumbersome. DoJ could even produce a full consolidation and an abridged consolidation similar to the green booklets, and the online version, which it already produces but shorn of the arbitrariness and compounded layering of mistakes inherent to the Indirect Amendment Method. These need not become mutually exclusive propositions. Furthermore, why doesn’t the Department of Justice provide for reference a compendium of the constitutional amendments promulgated through the Canada Gazette and by the Parliament of Canada and the legislatures of the provinces since 1982? It hasn’t even updated its website to that effect. Surely, it would behoove the Department of Justice to, at the very least, maintain an ongoing list of these amendments so that we don’t have to waste time combing through the archives of the Canada Gazette (Part II for the multilateral amending procedures and Part III for the federal statutes passed under the Section 44 Amending Procedure). Even provincial statutes passed under the Section 45 Amending Procedure shouldn’t be too difficult to track down in this Internet Age. But whatever. The Constitution of Canada says whatever you want it to say, I guess. It’s all about your personal truth. It says different things to different people. In my article “When the Bell Tolls for Parliament: Dissolution by Efflux of Time” and in my thesis, I argued that while Canada’s fixed-date election laws do not prevent the Prime Minister from advising the Governor to dissolve the legislature early and therefore do not mean that a legislature must least minimum of four years, these statutes have done one concrete thing: they have lowered the maximum lifespan of a legislature from five years to somewhere between four and five years. Ordinary legislation could never increase the maximum lifespan of a legislature in violation of section 4(1) of the Constitution Act, 1982 or section 50 of the Constitution Act, 1867, from, say five years to seven years. However, ordinary statutes can decrease the maximum lifespan of a legislature and still be entirely consistent with the Constitution Acts. And this is precisely what all constitutionally entrenched Canadian legislatures, except that of Nova Scotia, have done. A few days ago, I stumbled upon the perfect analogy in another parliamentary country to support my argument: The Republic of Ireland. The Constitution of Ireland – and yes, the document’s official name in English is “The Constitution of Ireland” and not the Constitution of the Republic of Ireland – for the most part codified the constitutional conventions of Responsible Government which existed in the Commonwealth Realms at the time of its enactment in 1937, thereby converting converted Responsible Government under a constitutional monarchy into Responsible Government under a parliamentary republic. However, the Constitution of Ireland does also incorporate confirmation voting in Article 13, section 1 such that the President appoints the Prime Minister (Taoiseach) and Ministers in accordance with votes from the elected lower house (Dail Erieann), and thus borrowed a Continental European innovation here. Article 16, section 5 of the Constitution of Ireland defines the maximum life of the lower house but also expressly states that parliament (the Oireachtas) could legislate a lower maximum life: “The same Dáil Éireann shall not continue for a longer period than seven years from the date of its first meeting: a shorter period may be fixed by law.” And this is precisely what the Oireachtas did through the Electoral Act, 1992, which lowered the maximum lifespan of a Dail from seven years to five years. Incidentally, the interplay of these two parts of the Constitution would seem to preclude dissolution by efflux of time per se, that is, automatic dissolution without any intervention by the executive. “2 1° Dáil Éireann shall be summoned and dissolved by the President on the advice of the Taoiseach. But it would also suggest that the Taoiseach must advise the President to the dissolve the Dail just before its natural lifespan runs out – which now stands at 5 years instead of 7. Basically, the Constitution of Ireland states unambiguously what the Constitution of Canada more implicitly implies: Parliament alone can lower the maximum lifespan of a parliament without a constitutional amendment. While I cannot update these journal articles themselves, I can at least add these new discoveries to my overall opera here on Parliametum. Who Amends Section 37 of the Constitution Act, 1867? This entry was posted in Amending Formulas, Constitution (Written), Crown (Powers and Office), Dissolution. Bookmark the permalink.